MOTHER CLUCKER SERVES UP TRADITIONAL SOUTHERN FRIED CHICKEN THAT’S MARINATED IN A SWEET TEA BRINE, DOUBLE COATED IN BUTTERMILK AND A SECRET BLEND OF SPICES FOR SUPER EXTRA CRISPINESS. 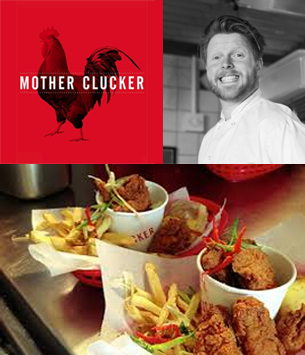 SERVED UP ALONG SIDE CAJUN FRIES, MAC AND CHEESE, BLACK EYED PEAS AND OUT HOME MADE SAUCES, Mother Clucker creates Louisiana-style fried chicken straight from the ‘Cluck Truck’, a former US army ambulance. Brittney, aka Queen Cluck shares her childhood pleasures of the fried chicken she enjoyed back in New Orleans. Papa Cluck and Rossie, who run the show, recommend their famous Southern chicken marinated in a sweet tea brine, coated in buttermilk and a secret blend of spices, twice-dunked for maximum crunch. Want something different at your next office event? Finding you has possibly been the best thing to happen to me this year!